Crack open a cold cream soda with New York or a West coast IPA with California. Crack open a cold cream soda with New York or a West coast IPA with California. 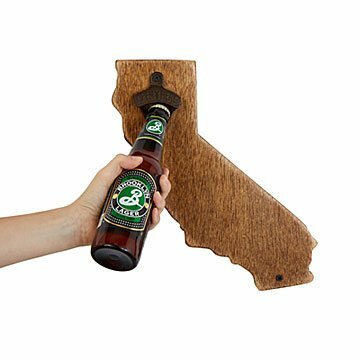 These wall-mounted bottle openers help you celebrate your favorite state every time you open a refreshing beverage. Hand cut from birch plywood that's stained a warm, chestnut brown, each one features classic cast iron hardware with a rustic patina. They're great for any spot that could use a handy opener with a touch of geographic appeal. Mounting screws included. Handmade by Whitney Herndon in Brunswick, Georgia, home of the 900-year-old "Lover's" live oak. See all available Wall Mounted State Bottle Opener. Whitney Herndon has always believed that it's the little things in life that make all the difference. Her hand crafted works of wooden art are living proof of that idea, right down to the grain. Marrying rustic charm with modern function, every piece is manufactured in Brunswick, GA, from the first sketch to sealing the box. See all Wall Mounted State Bottle Opener Measurements. My brother loved this gift for his bday. High quality product that looks nice enough that his girlfriend will let him display a bottle opener in the kitchen! The product is easy to hang and easy to use with any bottle! The WV one is a lot smaller than I imagined. It was a gift for my sister who always entertains at her house. A bottle opener is always missing so this was the perfect solution! Great idea and fun! I gave two separate gifts for Christmas and they were both ecstatically received! Just wish the wood was a bit sturdier. Concerned it may split later opening bottles. The product was high quality. My friends were super impressed by the level of product and how it will fit in with their kitchen. Super quick delivery and in safe packaging!